Deep within the halls of Norway's mountain kings, the earth has shifted slightly, widening the crack that splits the great block-shaped granite ledge of Pulpit Rock from the mountain behind. The rock, which the Norwegians call Preikestolen, is in Western Norway, 25 kilometres from the country's fourth largest city of Stavanger on the lovely, narrow, 42-kilometre Lysefjord (light fiord). 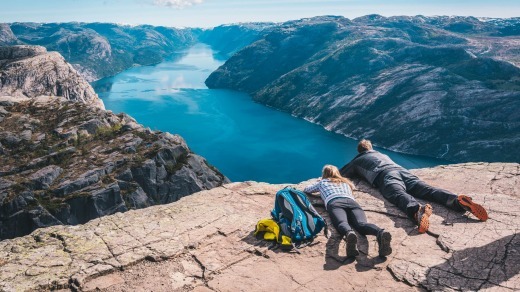 Its wild and gorgeous scenery offers one of Norway's most popular hikes, visited by about 300,000 people this year. Our Norwegian fiords cruise group has set out at the crack of glittering dawn to avoid the crowds, slogging up the quite difficult route to achieve the summit in time for an early packed lunch. Trying to emulate the sangfroid of Ragnar Lothbrok in Vikings, we perch on the unfenced 25-by-25-metre angled plane of the rock, eyeing the jagged crack on one side and the precipitous, 604-metre drop to the fiord on the other. Once on the high plateau, which was named in olden times by fiord travellers as Hyvlatanna (planed tooth), a stunning vista unfolds, wreathed in Norway's particular brand of cold, clear air. Geologists confirm the massive hanging wedge upon which we sit is still sound "for the foreseeable future", despite its protruding shape being the result of ice expansion about 10,000 years ago which sliced off huge chunks on either side. A certain bravery is required to scramble up to Pulpit Rock, named as one of the world's most spectacular viewpoints by Lonely Planet and the BBC. It's a steep hike up sharp-toothed boulders and along rocky tessellated paths that occasionally rush with icy mountain water. Narrow paths with abrupt drops challenge those with vertigo. Colossal, light-coloured mountains crowd the fiord, some reaching to more than 1000 metres. Green valleys and plains interlace with lakes and there below is our toy-like expedition ship, the MS Island Sky. To see it, we must creep to the edge. At least we don't have to hang off the sheer cliff face as Tom Cruise did in the recently released Mission Impossible: Fallout. The film has generated fallout of a different nature in Norway. Norwegian news websites have reported disappointment that Preikestolen is depicted as being in Kashmir, India. 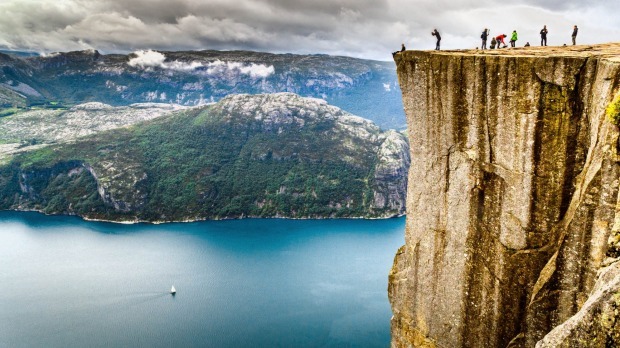 They say neither Norway nor Preikestolen is named in the film, despite it receiving more than a million dollars from the Norwegian Film Institute. Visit Norway is putting on a brave face, however, with its Stavanger director Elisabeth Saupstad quoted in Norwegian newspaper Dagbladet as saying people can quickly find out where the scene was filmed, regardless of how it is presented. 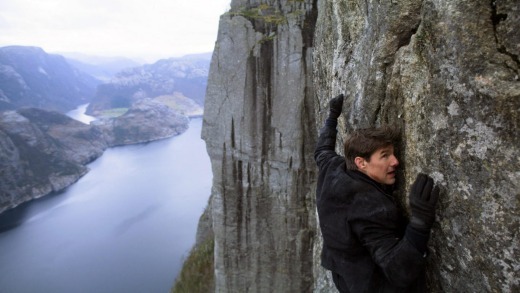 Perhaps Norway's annoyance was mitigated when thousands of Mission Impossible fans scaled the rock in August for a promotional screening. As for us, our "mission possible" involves a two-hour slog to reach the rock – first "discovered" in 1900 when a tourist made it to the top – followed by a two-hour downhill hike. 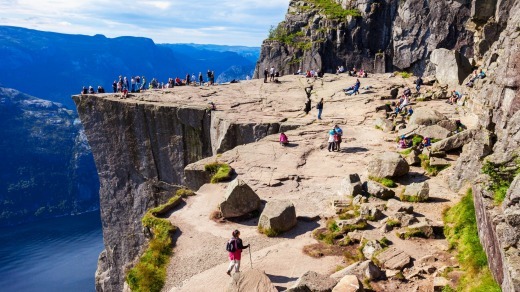 We start at about 270 metres at the Preikestolen Mountain Lodge and while the elevation differential is only 334 metres and the walk only about eight kilometres, we climb and descend various ridges, making for a significant elevation gain and loss. For the basically superhuman, nature-loving Norwegians, who often dominate the Winter Olympics in endurance sports, this is a relatively easy hike. It won't be so for everyone, however. You need good fitness, sturdy boots and a walking pole for the giant steps. Don't walk in winter or spring when there is snow and ice and the track is slippery. There's only one place for a helicopter to land to ferry out injured hikers. The best hiking season is from April to October. For those unexpectedly trapped by snow, a high hut offers shelter. Steep climbs alternate with pine forests, moors, plateaux and lakes where the hardy may swim (again, it helps to be Norwegian, though a couple of mad Irish boys we encounter are shivering, post-dip). The once narrow, almost impassable track has benefited from an upgrade courtesy of Nepalese sherpas – the workmanship is beautiful. Our early start pays off – our hike down is clogged with hikers on the way up. That evening, slightly sore of muscle and foot, but feeling virtuous, we tuck into caviar with buckwheat pancakes, succulent grilled fillet of Stavanger salmon with rosemary, olive oil and lemon butter sauce, and garlic roasted potatoes, then Black Forest cake with butterscotch sauce on the Lido Deck of the Island Sky. Fallout minimal. APT's 15-day Majestic Norwegian Fjords small ships expedition cruise from Tromso to Copenhagen starts from $16,895 a person twin-share, including a $900 a couple air credit. Based on an August 22, 2019, departure. See aptouring.com.au or call 1300 196 420.